For over 20 years, Nitro Tech has been a leading protein brand. Built on a foundation of human research and cutting-edge science, it's earned the trust of countless consumers worldwide. Now the same research and development team has pioneered a new formula based on superior protein sources, quality and manufacturing. 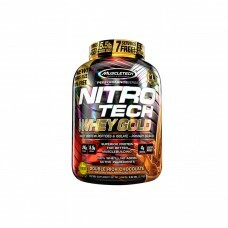 Introducing Nitro Tech 100% Whey Gold, a pure protein formula featuring whey peptides and isolate! Hydrolyzed whey peptides are the fastest-absorbing protein micro-fractions on the planet, which is why they are a significant part of our formula! Along with micro-filtered whey protein isolate plus whey concentrate, Nitro Tech 100% Whey Gold delivers superior absorption, digestibility and mixability. Each scoop serves up 24g of ultra-premium protein that supplies 5.5g of BCAAs and 4g of glutamine and precursor. 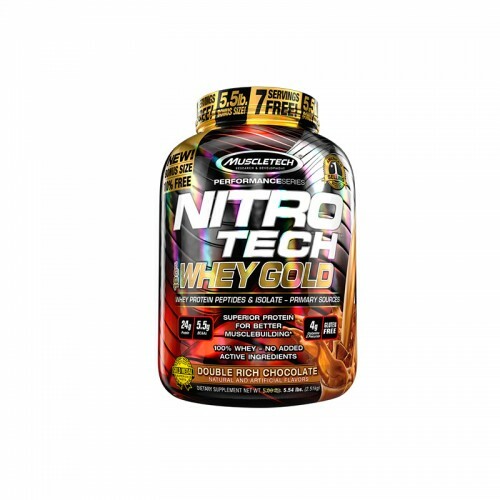 Nitro Tech 100% Whey Gold uses a superior cold microfiltration process to guarantee a higher quality whey protein. Combined with an award-winning flavour profile, Nitro Tech 100% Whey Gold is as good for your taste buds as it is for your muscles. Premium Protein Blend (Whey Peptides, Whey Protein Isolate, Whey Protein Isolate 97%), Whey Protein Concentrate, Natural and Artificial Flavour, Soy Lecithin, Gum Blend (Cellulose Gum, Xanthan Gum, Carrageenan, Dextrose), Salt, Silicon Dioxide, Sucralose, Acesulfame-Potassium. Mix 1 scoop with 6 oz. of cold water or skim milk in a glass or shaker cup. Use between major meals and before and after exercise. Processed in a facility that also processes Peanut, Tree Nut, Egg, Fish/Crustacean/Shellfish Oil and Wheat products.